1. For vinaigrette: Place all ingredients, except the oil and poppy seeds, into the well of a blender and blend until smooth, 1 to 2 minutes. 2. With the motor running, remove cap of the blender lid and slowly drizzle oil into the mixture until completely incorporated and vinaigrette is smooth. 3. Pour vinaigrette into a large bowl and stir in poppy seeds. Season with salt and pepper and set aside. 4. For citrus: Slice top and bottom of the grapefruit off and lay onto one of the cut sides. Carefully slice peel off sides of grapefruit. Turn grapefruit onto its side and slice into 1/2 inch slices. Repeat with remaining citrus. 5. 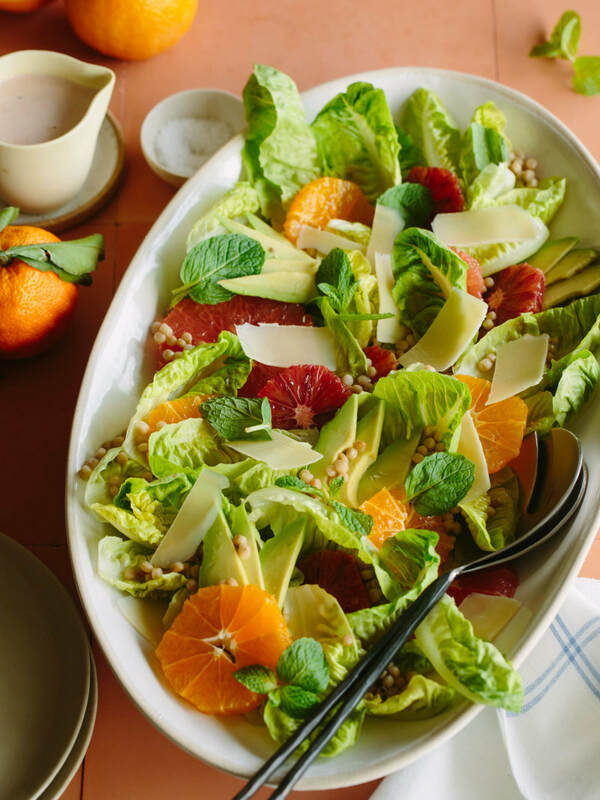 To assemble: Spread lettuce leaves and citrus rounds onto a large platter. Sprinkle salad with couscous, drizzle with vinaigrette and top with shaved Parmesan. Finish with cracked black pepper and serve.